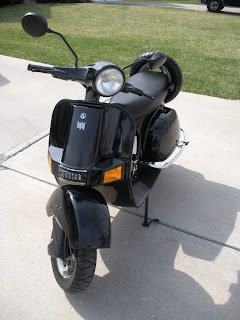 Originally based on the Italian Vespa Sprint, the Chetak was an affordable means of transportation for millions of Indian families for decades and termed as humara bajaj. Around 1980, the Vespa-licensed design was replaced with an all new in-house design that shared the same general appearance and style. During its heyday its chief competitor was LML NV made by LML India as a licensed copy of the Vespa PX 150. In the face of rising competition from bikes and cars, the Chetak lost ground in India, and production was discontinued in 2009. In India scooters were the first two wheeler which became the common means of transport for Indian families.My father also owns a Bajaj Chetak and it still looks and perform awesome on the road.We still ride it and we just love it.